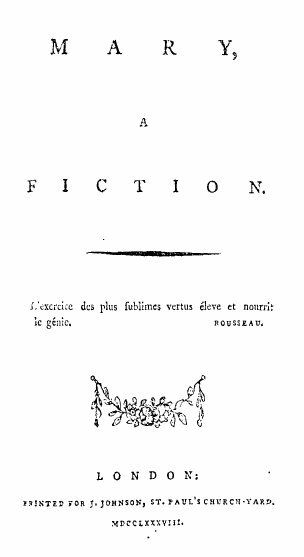 Mary: A Fiction (1788) is Wollstonecraft's first and only completed novel (she left behind several uncompleted manuscripts at the time of here death in 1797). The story follows a young woman as passes through two "romantic friendships" with a man and a woman. It features some of the themes that would become more predominant in her later writing. Return to the Mary Wollstonecraft library.